Won’t get into boring descriptions except for to say that I put this together literally 2 days before Halloween. 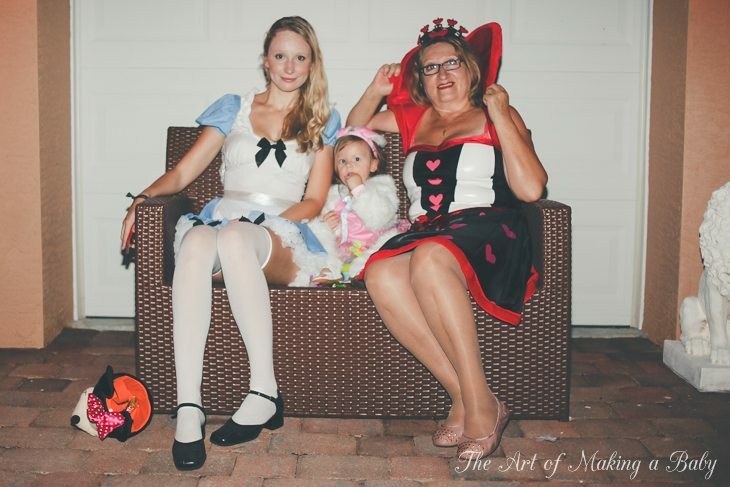 Our plans to spend Halloween at Disney got cancelled and we dragged our feet on anything else until I decided that, rather than trick-or-treating this year, I would like to host trick-or-treaters. 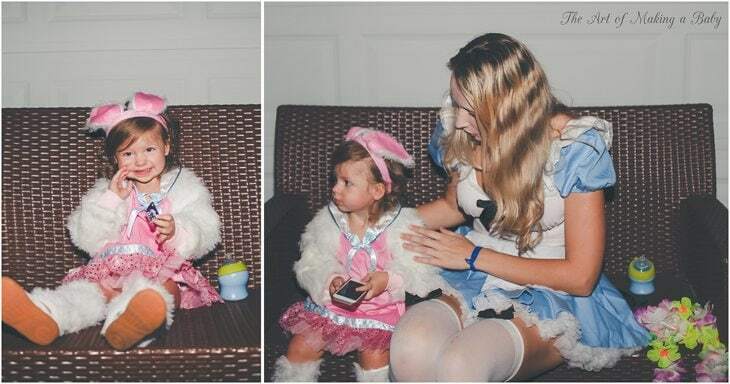 I had an Alice in Wonderland costume laying around from the old days, so I quickly ordered the others for the rest of the family with Lexi being the little rabbit and my niece- dark Alice. 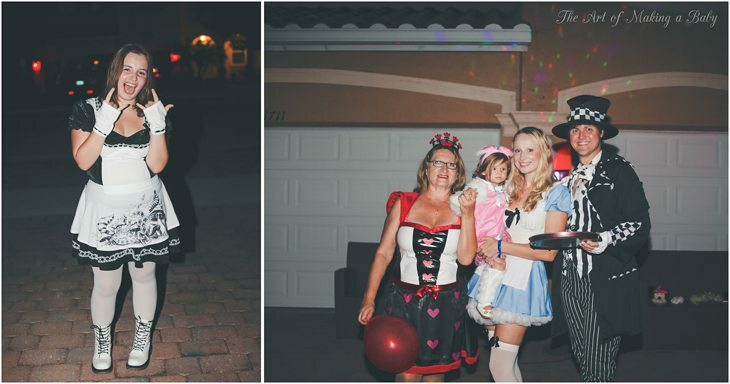 It ended up being a lot of fun despite Alexis waking up too late after her nap and being upset at having to be put into a scratchy cheap and hot costume and rushed outside to give out candy. At the end of the evening though, she was socializing like a pro and attempting to steal candy. She had one full bite size Milky Way and thoroughly brushed teeth afterwards. In the morning, the second her eyes opened up, she was up and running outside saying “Halloween! Treat Or Treat!” It was so sad to have to tell her that it’s over. Next year, we’ll get her all pumped for the holiday with decorations, and definitely visit Mickey’s Not-So-Scary Halloween Party- get the most out of the fun. I am just not a holidays person… Never been. Too much effort and I always have so much to do that doesn’t involve spending hours on Pinterest or decorating the house… Sad. That’s something I need to change. Photos at the end are from friends’ Halloween party that we visited, stopping at some Halloween store to pick up that bee costume at the last second ( story of our lives, I wonder when/if it will change…). The End. 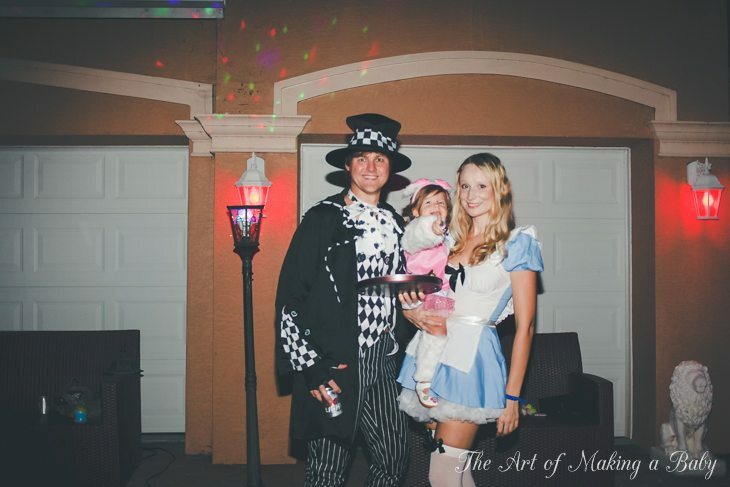 Oh and btw, Andrew was the COOLEST in his Mad hatter costume. He is so tall as it is, but wearing the hat and the pants! He was a hit! In fact, as far as I can remember he is a hit almost every Halloween, like the one where he was Borat– everyone loved him! If you want to have the time to do things (decorate, browse Pinterest, etc) then you should make the time. I know it can be hard, but if it’s important to you then it should be a priority. I have always believed that you’re as busy (or not busy) as you make yourself. While, yes, you may have committed to a million and one things, building fond memories and traditions for your family is also important. If you don’t give yourself down time, you’re going to go crazy! Everyone needs a break from their lives. Yes, I agree and I am attempting to do that. Decorating isn’t important to me, but it is important that Lexi experiences holidays the “right” way. So I am attempting so reshuffle priorities and concentrate on m family and Daily Mom. Unfortunately that means that this blog, or a few other things suffer in the meantime. Better to have those suffer than your family :] and I think all your readers will survive. Fun times! 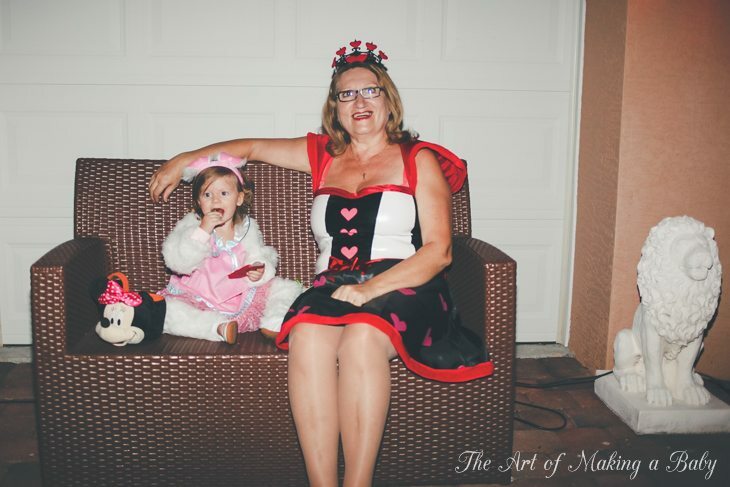 I have a daughter Lexi’s age (which is how I came to read your blog) and we also found it to be more fun to sit at the house and give out candy, rather than “trick-or-treat.” Was Lexi scared by any of the costumes? My Mary was, started crying at one point. ???? What kind of bottle is that? I am still nursing Mary (though not at night, and I think we are BOTH releaved– so much better sleep at night). But we still haven’t found a great bottle/sippy cup for her. What milk do you give her? She wasn’t scared by the costumes per se. I went back into the house, hung out with her till she was comfortable again and then we went back and out and this time she was fine. But I didn’t see a costume that actually scared her. Oh and the bottle, it’s a sippy cup by Boon. I don’t give her milk. She just has water and BM. Thanks for the sippy cup name. I’ll try that. I guess the color of it looked like it has milk in it. I’m going to try almond milk. Have heard good things. You don’t have to go all out Pinterest style to do holidays. My child is the same age as yours and we don’t have the time to Pinterest-decorate our house, but we still have time to decorate and do all of the fun things for the kiddo. They will appreciate that you did it, not that you went all fancy. The “right” way has zero to do with how much money and time you spend on decorations and preparations. The “right” way is whatever makes your child happy and is a fun memory for the family. Your photographs always look so professional! If you don’t mind me asking, what kind of camera do you use? Might I suggest making holiday decorations with your daughter… Kind of kills two birds with one stone AND your daughter will be incredibly proud of seeing HER decorations up. Who cares what it looks like, you’ll both have a good time. 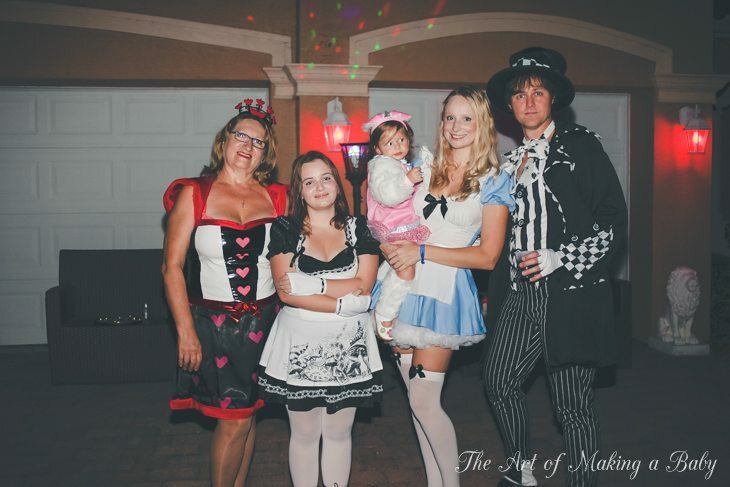 Hehe, love all the costumes, especially LOVE the Mad Hatter costume! Is Lexi going through a particularly fast growth spurt? She looks so much more grown up with every set of pictures!! I am not sure about her growth spurts…when you watch them grow, it’s not as obvious. But i wonder how tall she is now. 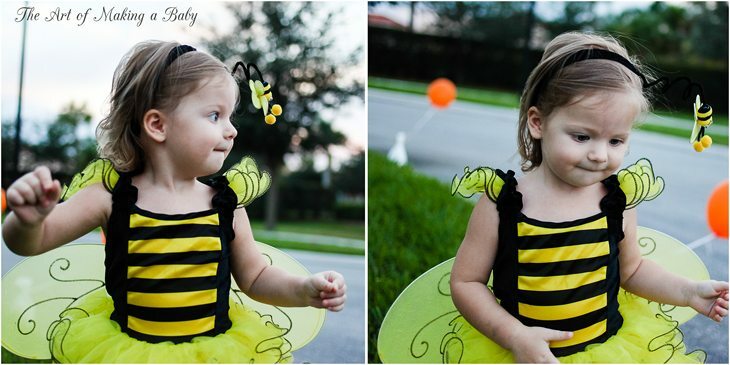 That bee costume is so cute! Alexis is starting to look like a little girl and not a baby anymore 🙂 Don’t worry about the decorations and making your house look like a Pinterest board, just worry about time spent with your daughter and the traditions you make. Do you really remember the holiday decorations from your childhood? I don’t remember many! I do remember making Christmas cookies and dinners together. Just have fun with your family!